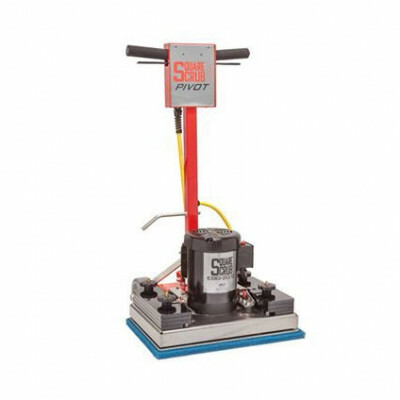 Square Scrub® 20C Chemical Free Floor Stripping Machine - 14" x 20"
This Square Scrub chemical free floor stripper, the EBG-20/C, features a smooth 3450 rpm motor for efficient stripping. Even though the machine weighs in at 156 pounds, there are additional weights that can be added to the head, for additional down pressure in those heavy duty stripping areas. The pivoting head design allows for balanced contact and better control while giving the unit near ideal weight distribution. This machine can easily handle stripping, and/or deep scrubbing of marble, concrete, VCT and wood floors found in gymnasiums, bathrooms, hallways, and entrance ways. This model is available with the vacuum kit which is designed specifically to remove airborne particulates (but not designed to remove debris from floor). The vaccum comes with a hose adapter and is CRI Gold Certified and HEPA rated. We also have a much more economical version of these machine available, the Square Scrub EBG-20/E floor machine, which weighs 114 pounds, and cannot have additional weights added to it. Chemical free stripping not only saves you money by not having to buy a stripping solution, but it also offers a time saving mechanism. You no longer have that messy slurry to pick up that is created from a stripping solution. All you need to do is recover the dust created from the job, and then dust mop the area. Rinsing and applying new coats are simple as well, as long as you are using our floor finish backpack applicator. For other chemical free stripping machines, take a look through all of our dry stripping floor machines. Removable weights can be added to your Square Scrub machine for added weight on stripping jobs. Optional CRI Gold Certified and HEPA rated vacuum can be use to recover the dust created from the job. Specialty EcoPrep pads can be used for chemical free stripping. 6" transport wheels allow you to easily transport the machine from job to job. Can strip up to 2,500 sq ft/hr on VCT, and 5,000 sq ft/hr on a wood gymnasium floor. 2 year warranty on the motor, and 1 year on all non-wear parts. Customers who were interested in the Square Scrub® 20C Chemical Free Floor Stripping Machine were also interested in the following items. This is a review for the Square Scrub® 20C Chemical Free Floor Stripping Machine.